Besides being the center of brassware and silk weaving, which Varanasi is also known for, the city is home to some of the most important temples in South-eastern Asia. A travel to this area can be considered spiritual as it is cultural. As a “site of spiritual luminance” as it is sometimes called, it surely is the cradle of culture that has withstood the test of time. To get around Varanasi is quite a challenge. You can either walk around or take a boat ride across the river. Biking is also a popular medium of transport here. However, getting lost in the alleys and Ghats of this ancient city is a great way to stumble upon hidden treasures and temples. The most famous and important ones dot the riverside of the Ganges. 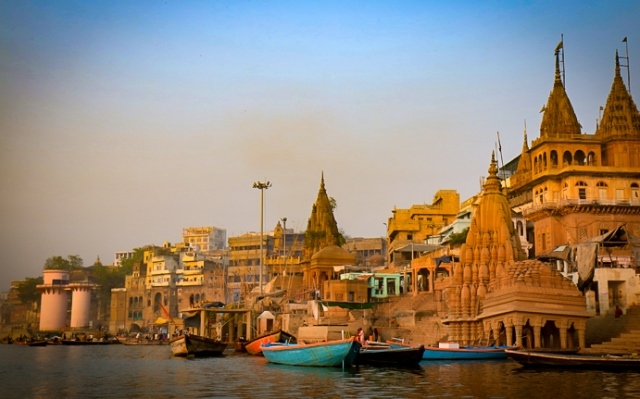 The Kashi Vishwanath or the Golden Temple is one of the most visited temples in the area. Situated near the Ganga Ghats, this holy structure was made to honour the Lord Shiva. It was said that because of repeated attacks of invading cities, the building that we see now is relatively modern in design. Getting to the temple will require you to walk through a narrow and crowded alley as you snake your way through a large crowd. You will see that the building is actually made up of three smaller shrines. The temple spire and the dome will have to be the most extravagant parts of the building as these are plated with gold. At sunrise or sunset, the temple shines like a treasure in the middle of Varanasi’s colors. Interestingly, a small well called Jnana Vapior or the “wisdom well” is located on the side of the temple which is where the Jytorlinga was said to have hidden during the time of invasion. Another important temple in Varanasi is the Annapurna Temple, dedicated to the “Goddess of Fooding” Devi Annapurna. An interesting piece of worship in the temple is the golden idol of Annapurna. This temple though is only opened during the Hindu festival of Diwali. As the city of worship as it is aptly called, Varanasi is also home to the Bharat Mata, Sankatha, Kalbhairav, Mrittunjay Mahadev, New Vishwanath, Durga, Tulsi and Sankatmochan temples to name a few. To get to the other lesser known ones, you will need a tour guide who is very familiar with the roads in Varanasi. Visiting the Varanasi Temples offer a very moving experience of both surreal and genuine. Every step taken, the sights seen and sounds heard, all offer a unique sensory gratification that truly leaves with you even when you have left Varanasi.